The hole in the center of the first Thor movie. Okay, one of the holes in the first Thor movie. Superhero movies aren't known for their tight, cohesive plots, but there's a fracture in the plot of Thor that's driving me nuts. Odin rears Thor, his natural-born son, and Loki, his secretly adopted son, as brothers. Both are eligible for the throne; Thor wins it because he's better than Loki in some undefined way. On the verge of giving Thor the throne, Odin withdraws it because Thor wants to commit genocide. Thor tries to commit genocide anyway. (Just a little bit. A mini-genocide.) Odin strips Thor of his powers and banishes him. 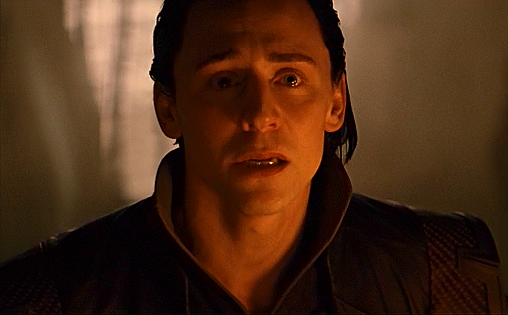 Loki learns of his true ancestry and confronts Odin: You never loved me, you only took me for your own purposes. Of course Thor was your favorite. I never had a chance. You said I could be king if I was good enough, but you lied, because you could never put a frost giant on the throne of Asgard. Odin denies it, but of course he would; and he falls into Odinsleep before he can convince Loki. Loki becomes king by default. He hatches a scheme to win his father's love: He'll sneak some frost giants into Odin's chamber, then kill them, and everyone will think he's a big damn hero. Then he'll commit genocide. Odin will be so pleased at the genocide that Loki will be his favorite forever and ever more. There's another story underneath it, one that doesn't require Loki to decide that the gift Odin wants most is a festively wrapped box of genocide. It fits so well that I'd suspect it was the intended story, except that neither Thor nor The Avengers and Thor 2 notice this story exists. Loki tricks Laufey into Odin's chamber, then claims his position as the son of Odin, and kills his birth father in front of his adoptive father. He means nothing to me. He's not my father. You are. He tries to wipe out the race of frost giants. I'm not a monster. I can't be a monster if monsters no longer exist. I erase my people, my father, the very land where I was born. I cut all the ties drawing me away from you. You can trust me now, Father. You can love me. It's madness. It's a son forgetting what his father wants in his desperation to not be what his father doesn't want. It's a lost and neglected child striking at the thing he blames for his neglect, instead of the father who neglected him. If Loki were thinking logically, he would realize that destroying Jotunheim wouldn't earn him Odin's love, but it's logical for him to be illogical at that moment. All the pieces are there. It would take only a few lines of dialogue to establish this version of the story. They wouldn't even have to be Loki's lines--Odin could do it in the final scene by responding to what Loki was really trying to do, instead of what Loki said he was trying to do. But if that was the direction the story was intended to take, somebody would have noticed that Loki killed his own father. Kind of a central event, don't you think? He didn't zot some random frost giant. He didn't kill Laufey not knowing that Laufey was his father. He didn't kill Laufey in self-defense. He didn't kill Laufey clandestinely. He deliberately led Laufey--not any random frost giant, but his father Laufey--into Odin's chamber specifically so he could kill Laufey in Odin's presence. Even in the goriest comic book, first-degree patricide is a notable moment in a character's life. But no, the act isn't mentioned a single time in any of the three movies, including the movie where it happened. People act as though his assault on New York was a far more important character-defining moment, even though loosing an army on New York is the first step in any self-respecting villain's career. Driving me nuts, I tell you. The story could have been so much richer if it veered away from the usual punch-things-because-punching-makes-you-glorious superhero motivations and delved a little, but there was no delving. Only more punching. Say more, for your thoughts are a delight. I really like this interpretation. It's not one I had, maybe because I glossed over that movie pretty hard, but it's awesome. It is, alas, a highly glossable movie. (You know what's really frustrating? The deleted scenes contain a ton of little interactions that make the movie make so much more sense.) Glad you like my interpretation, though. Loki, I has feels re: him. It took me two tries to watch Thor. He was a raging jackhole for the first 15 minutes, and I realized that if this was a theater I would have walked out and asked for a refund, so I closed my Netflix window. Eventually I went back, and learned that a minute or two after where I left off, the whole movie changes. The friend who recommended the movie to me said it has "pacing issues." That's a mild way of putting it. If you're going to make your main character into a spoiled man-child, you need to a) show some of his finer qualities right quick, and b) make it clear that the universe's smackdown is on the way. There's a deleted scene between Thor and Loki that's set just before the coronation and gives a much better idea of both characters, but no one punched anyone else, so they cut it. That is a thing of wonder and glory. Am devouring the rest of the series now. Thank you, thank you! Well and wisely pointed out. I thought that WAS the storyline. But it's been a long time since I saw the movie. *grin* Glad someone else saw that too, then. But no, Loki decides to create a second false crisis so people will see that it's necessary to destroy the frost giants, because... because reasons. I know, right? RUN WITH THE ANGST, MARVEL, YOU CAN DO IT! Are you who I think you are? I feel like I keep running into you in places and having fun conversations with you. This is a super unhelpful comment, isn't it. I should PM you or something. Even if she isn't who you think she is, y'all should definitely get to know one another. You have a similar taste for mischief.